The city that never stops building. UPDATE: Council Speaker Christine Quinn, in whose district the project is located, gave her strong support for it at a press conference before today’s meeting of the City Council. More below. The battle for the soul of New York—or at least for its skyline—was over before it even really began. The City Council Land Use Committee just voted in favor of Vornado’s roughly 1,200-foot, Pelli Clarke Pelli-designed 15 Penn Plaza, apparently unswayed by complaints from the owner of the Empire State Building, Anthony Malkin, that it would ruin views of his iconic tower, and thus the city as a whole. In fact, the issue of the skyline barely even came up, and when it did, the council members, who voted 19-1 for the tower, essentially said New York must build to remain great. “I think it’s a project the city needs,” said Councilman Daniel Holleran, a Staten Island Republican. The bigger issue, by far, than the dueling towers was that of who would build 15 Penn Plaza, namely MWBEs. That’s the policy shorthand for women- and minority-owned business enterprises. The council, like the city, is majority minority, and so ensuring employment for minorities, particularly in the notoriously cosseted construction industry is often a high priority. When Vornado showed up at Monday’s hearings without a specific plan for how it would ensure a portion of the contractors on the project would be MWBEs, the committee members were displeased. Councilwoman Letitia James Albert Vann asked if the company even had any sort of minority hiring practices, to which the head of the New York Office, David Greenbaum, joked that he was not sure but had had a party recently at which there were many women, and his wife asked which were employs and which were spouses and he said, with a chuckle, that it was more of the former. James was not amused. Vornado proffered a last minute MWBE plan before today’s vote, calling for at least 15 percent of all construction work to be done by MWBEs. Whether the project would have been torpedoed without it is hard to say, but it did little to assuage council members complaints at the same time they overwhelmingly voted for the project. James Saunders, one of the council’s lions on MWBE issues, made his frustration known. “This is a tepid response to a need, a very tepid response,” he said of the new MWBE plan. “We can’t go on like this. That we even have to have this discussion shows that there needs to be some real dialogue here.” Holleran expressed disappointment that the council does not use its limited leverage over such projects to extract more concessions early on than at the very end, when development projects have essentially reached the stage of fait accompli. Not that it would have mattered if there was any real opposition, as the mayor cast his considerable weight behind the project yesterday, according to the Wall Street Journal [sub. req.]. Malkin was not at today’s vote. And perhaps its was with good reason that the council did not take up his position. As our colleague Eliot Brown points out over at the Observer, the skyline fight is not that disimilar to the one over the Ground Zero “Mosque,” in that it’s a supremely local issue that has been given over to if not irrational than at least emotional pleas for something locals could care less about. After all, we’re only ruining the view from Jersey. Yet again, the debate surrounding this project was only nominally about the project at hand. Quinn said that she was happy with the MWBE agreement that had been reached with Vornado while also stressing that such matters were not technically under the purvey of the city’s land-use review process. When we asked if they should be, Quinn demurred. 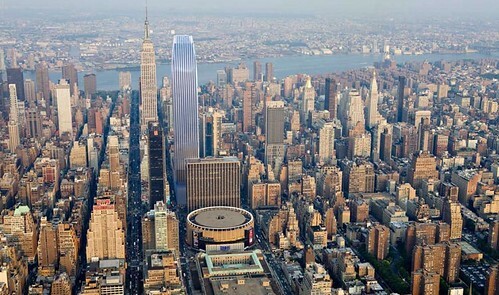 On a less demure note, Curbed is reporting that the real reason Malkin is so opposed to 15 Penn Plaza is because it’s potentially throwing off the feng shui of his tower, killing the “life force” of the Empire State Building and thus a deal with a business from Hong Kong to lease space in the tower. And now we’ve heard everything.